Powerstream point-of-use tankless water heaters are designed to provide an endless supply of hot water for kitchen, bathroom and hand-washing sinks. 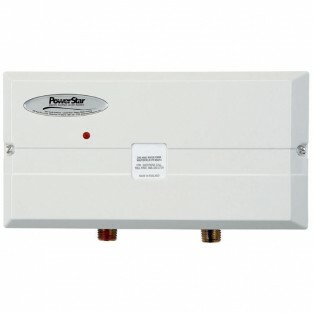 PowerStar heaters feature solid copper heat exchanger, copper-sheathed elements and tough plastic housing. This 9.5kW point-of-use electric tankless water heater can provide enough hot water to run a sink. The PowerStar AE9.5 requires a 40AMP breaker at 240V. LIMITED 10 YEAR WARRANTY COVERAGE BOSCH THERMOTECHNOLOGY CORP. FOR PowerStar RP17PT and RP27PT. LIMITED 5 YEAR WARRANTY COVERAGE BOSCH THERMOTECHNOLOGY CORP. FOR PowerStar RP POINT-OF-USE SERIES guarantees this water heater to the original owner of the water heater at the original installation location against defects in material and workmanship for the periods specified below. 1. For RP17PT and RP27PT - The Heating Modules - If the original heating modules leak or fail within ten (10) years from the date of original installation of the water heater because of a defect in material or workmanship, Bosch Thermotechnology Corp. will furnish to such an owner a replacement heater of the then - prevailing comparable model. However, if the water heater is installed in other than a single family dwelling this heating modules warranty is limited to two (2) years from the date of original installation and operation. Note : Damage caused by exposure to freezing conditions is not covered by the warranty. Note : Damage caused by scale formation is not covered by the warranty. For the RP Point-of-Use Series - The Heat Exchanger/Element - if the original heat exchanger leaks or the heating element fails within five (5) years from the date of original installation of the water heater, because of a defect in material or workmanship, Bosch Thermotechnology will furnish such Owner a replacement heater of the then prevailing comparable model. 2. Any Component Part Other Than the Heating Modules - If any other component part (other than the heating modules) proves to be defective in material or workmanship within one (1) year from the date of original installation of the water heater, Bosch Thermotechnology Corp. will furnish the owner with a replacement of the defective part(s). 3. Verification of Date of Original Installation - When owner cannot verify or document the original date of installation, the warranty period begins on the date of manufacture marked on the tag affixed to the water heater. 1. THIS LIMITED WARRANTY SHALL BE THE EXCLUSIVE WARRANTY MADE BY THE MANUFACTURER AND IS MADE IN LIEU OF ALL OTHER WARRANTIES, EXPRESSED OR IMPLIED (WHETHER WRITTEN OR ORAL), INCLUDING, BUT NOT LIMITED TO, WARRANTIES OF MERCHANTABILITY AND FITNESS FOR A PARTICULAR PURPOSE. 2. Manufacturer shall not be liable for incidental, consequential, special or contingent damages or expenses arising, directly or indirectly, from any defect in the water heater or the use of the water heater. 3. Manufacturer shall not be liable for any water damage arising, directly or indirectly, from any defect in the water heater component part(s) or from its use. 4. Manufacturer shall not be liable under this warranty if: a) The water heater or any of its component parts has been subject to misuse, alteration, neglect or accident, or; b) The water heater has not been installed in accordance with the applicable local plumbing and/or building code(s) and/or regulation(s), or; c) The water heater has not been installed in accordance with the printed manufacturer's instructions, or; d) The water heater is not continuously supplied with potable water. 5. The owner and not the manufacturer or his representative shall be liable for and shall pay for all field damages for labor or other expenses incurred in the removal and/or repair of the product or any expense incurred by the owner in order to repair the product. SOME STATES DO NOT ALLOW THE EXCLUSION OR LIMITATION OF INCIDENTAL OR CONSEQUENTIAL DAMAGES, SO THE ABOVE LIMITATION OR EXCLUSION MAY NOT APPLY TO YOU. THIS WARRANTY GIVES YOU SPECIFIC LEGAL RIGHTS AND YOU MAY ALSO HAVE OTHERS.